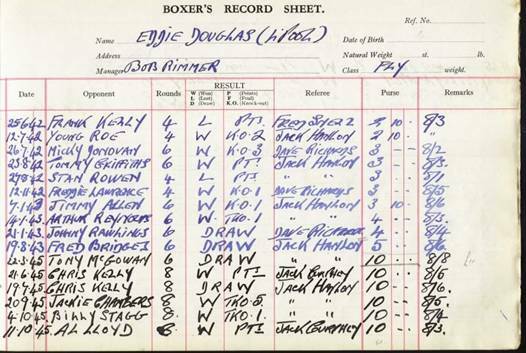 Liverpool's Eddie Douglas loved boxing. As a fighter he gave pleasure to thousands during and after the war. Eddie, who was a more than useful bantam and flyweight in his time, saw boxing virtually disappear from his life when he made the move to Australia in 1953. Eddie was introduced to boxing as a 16 year old in 1939 when a friend took him to St Patrick's Club. He won only one and lost three of four junior fights but won three of his four senior contests for the Metropolitan Club before he turned professional. He almost signed for manager Harold Higginson with whom he was working, but fate conspired otherwise. Higginson was taking him along with Gordon Ashun to a show at Bridworth for his professional debut but the car broke down and they never made it. Soon afterwards Bob Rimmer, who lived near him in the Princes Park area, turned up and asked Eddie to sign for him. Altogether he boxed professionally from 1942 until 1948 going out on a title-winning note in his last contest winning the North Central Area flyweight title. He had around 40 contests and won far more than he ever lost. In his ring debut he met stable mate - Frank Kelly, losing on points. Next time out he substituted for Eddie Monaghan and knocked out Young Roe of Preston in two rounds and then KO'd Mickey Donovan in three. He then out scored Tommy Griffiths who had beaten Frank Kelly and in his fifth outing came up against the former amateur star Stan Rowan, later to fight for the British title. It was Rowan's debut and a four-rounder. Eddie boxed badly but came back to drop him in the fourth, only to lose on points. Eddie then lost to Johnny Rawlins at Blackpool on points despite having him down in the third, fourth and fifth rounds. But next time he stopped Freddie Lawrence in one round having him down twice. At about this time Eddie was working with Harold Higginson helping repair bomb damage at the Stadium. You could say he was building the hall up during the day and knocking opponents down at night. His eighth and ninth outings came in the space of 24 hours. On a Thursday night he KO'd Jimmy Allen in one round at the Stadium and the following night went to Blackpool to complete the double over Alf `Young' Roe of Preston, whom he had previously knocked out. His good run continued against Seaman Reynolds, whom he stopped in January 1943. Jumped at the chance of a return with Johnny Rawlins who had previously out punched him and again dropped him a couple of times but could only get a draw. 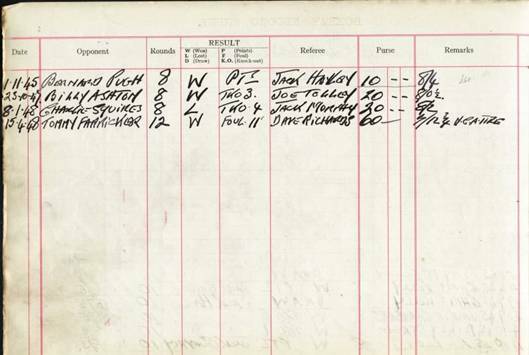 With Home Guard and other commitments he had a seven-month break but came back to draw with Fred Bridges, a very game fighter. It was about this time that he got a telegram asking me to box Al Hutt of Burma at the Stadium. It looked a real break as Hutt was quite a big name at the time. Eddie turned up at the Liverpool Stadium only to be told it was a mistake and when he didn’t get paid anything he packed up boxing for two years. Two years later he had gone to a booth in Sefton Park and though he refused to take any money agreed to box a lad called Billy McConnell. Liverpool manager Les Douglas was among the crowd and afterwards asked him to sign. His comeback was a four-rounder with Fred Bridges at Manchester's White City, losing the decision. Some of his best wins were over Chris Kelly, Billy Ashton (Wigan) who he twice stopped, Dickie Davies (Wigan) KO in two, Joe Colns (Sunderland) in three rounds and a good win over Scotland's Frank Tierney who beat Joe Curran and Al Hutt. He took Tierney at short notice at Blackpool and stopped him in six. He also beat Bernard Pugh who was just starting out and had a good losing battle with Billy Davies at Abertillery. He also lost to Norman Tennent at New Brighton. Tennent would go on to win the Scottish title. He twice beat Tommy Farricker of Manchester, the first time in ten rounds and the second, which proved to be his last ring appearance, in April 1948. Taken from Syd Dye's article which first appeared in the Liverpool Echo on 6 September 1975.